If you’re anything like us, you’ve probably spent the first few weeks of January wondering where you are, exactly. We feel you. But as soon as you feel like you have your head screwed on straight, you’ll want to turn your mind to what the year has in store. If you’re in business, it’s worth taking the time to draw up a plan of attack. And no matter what kind of business you’re in, you should think about how to manage your expenses. In this post, we’ll look at our top seven spend management software solutions for 2019. Whether you’re a freelancer, a growing startup, or an established enterprise, we’ve got some handy tips and suggestions to help you save time, money, and stress. To kick things off, let’s run through a few basics. What is spend management software, exactly? Put simply, spend management software is any tool dedicated to helping your business manage employee expenses quickly and conveniently. This can run the full range, from simple receipt scanning tools through to credit facilities linked to accounting software. Petty cash: For small purchases, a lot of companies kept a box full of loose cash and coins on hand. How much was in there? And what were the rules, exactly? Who knows. No wonder they were such a black hole for company dollars. Company credit cards: Ah, the company plastic. Despite the risk of fraud, the lack of accountability, and the delayed oversight of spending, a lot of businesses still can’t seem to kick the habit with this one. Expense claims: Rounding off this unholy trinity is the dreaded expense claim. Here, employees paid business expenses out of their own pockets, then held on to the receipts, filled out a claim form, and waited ages to be reimbursed. The horror! Fortunately, managing expenses no longer has to be quite so painful. Now, there are better ways for businesses to pay for things, and employees can manage their expenses conveniently, securely, and quickly. But what makes good spend management software, exactly? What makes a good spend management software? When it comes to spend management, not all software is created equal. Real-time expense tracking: You don’t want to have to wait until the end of the month to find out how much you’ve spent. Instead, find a solution that tracks expenses in real-time, providing a reliable snapshot of employee spending. A quick and simple overview: If you can’t understand your spending at a single glance, something’s not right. Good spend management software presents expense information in a clear, compelling way, putting you in control. Customisable payment options: Not every employee needs access to the same funds. Your software needs to give you the option of customising the amount available to each person, and what they can spend it on. Easy document capture: Businesses spend a lot of time storing and processing documents like invoices, receipts and purchase orders. A good software solution helps you capture and store these documents quickly and conveniently. Time-saving automation: The most significant downside to traditional expense management is that it takes up so much time. Great spend software can free you up to focus on better - and more fun - things. This might seem like a lot, but it boils down to a simple idea: find a solution that gives you and your team a quick, secure and convenient way to pay for stuff. With that in mind, let’s take a look at our software picks for freelancers. If you’re a freelancer or solopreneur (it’s a word, trust us), you want a quick and nimble spend management tool that’s easy to get to grips with. For people working either alone or on a smaller scale, simplicity is key. After all, you probably already have a pretty decent idea of your expenses if you’re the only one making business purchases. With this in mind, we have a couple of great tools to save you Lone Ranger types a bunch of time and effort. Expensify is a handy expense management tool used by many small businesses. With Expensify, users can import expenses from an existing credit card, and can generate expense reports quickly and easily. 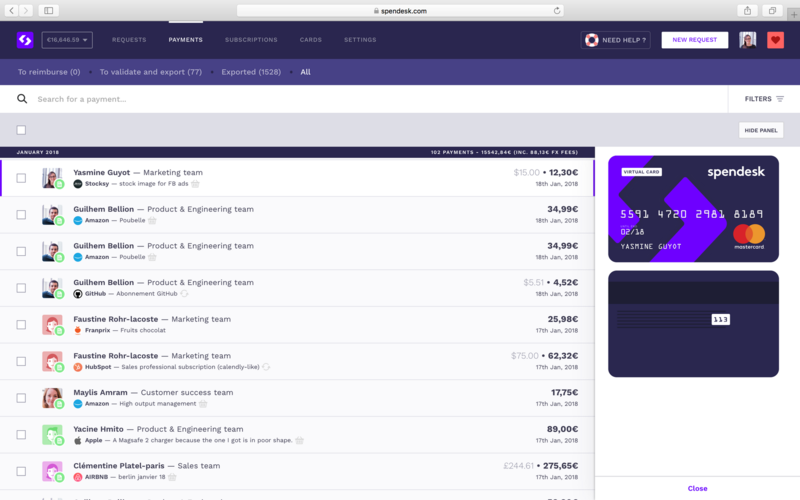 Aimed at freelancers and emerging businesses, Expensify helps to automate recurring payments, and also makes it a lot easier to record and process expenses. Expensify also wins points for its smooth user interface, presenting expense information in a single screen. Pros: Easy to use; well-suited to small and emerging businesses. Cons: Some reports of software integration issues. Receipt Bank focuses on nailing one thing: easy data extraction from invoices, bills, receipts, and other expense documents. With Receipt Bank, users no longer have to worry about keeping physical copies of documents, and can instead scan and automatically upload them to a range of accounting software. This simple design has already saved countless hours of time for freelancers and small business owners. Check it out, and see how it could help you. Pros: Simple concept; great integrations; time-saving data extraction. Cons: Limited features aside from its core purpose. Now, let’s take a look at a couple of handy tools for growing businesses. Expense management can be particularly tricky for growing businesses. If you’re a medium-sized startup, you might think you can just get by relying on tried and true methods like employee expense claims. Trust us - as soon as you start using a dedicated expense management tool, you’ll never want to go back. For growing businesses, it’s important to find a software solution that is intuitive and quick to integrate, all while being affordable. Fortunately, we’ve got a couple of suggestions. 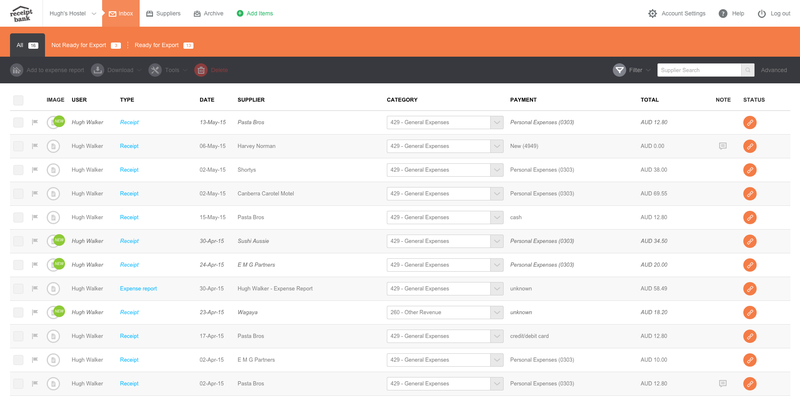 Spendesk is a comprehensive expense management tool with a bunch of intuitive and helpful features. 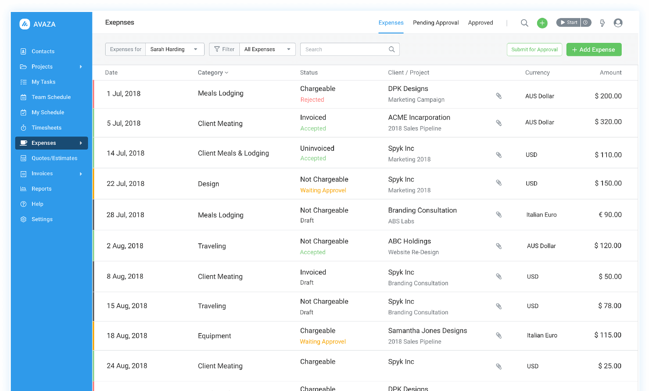 With Spendesk, businesses can automate recurring expenses and automatically match invoices to expense claims (thanks to OCR software), saving a lot of time. Where Spendesk really comes into its own, however, it in its flexibility. Spendesk allows companies to tailor debit cards to individual staff and categories of spending, and also offers single-use virtual credit cards for online purchases. Spendesk also offers same-time payment validation via push notifications, as well as a point-in-time overview of expenses, bringing everything together in a single comprehensive dashboard. Spendesk also integrates with most accounting tools. Pros: Intuitive to use; strong focus on security and flexibility; great integration. Cons: Better suited to growing businesses rather than lone entrepreneurs. 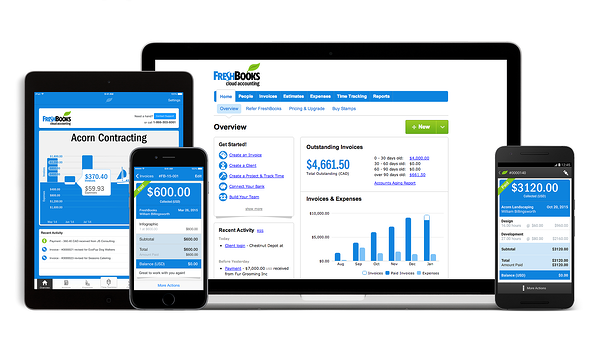 Marketed primarily as accounting software, FreshBooks also features an automated expense tool allowing users to record and manage expenses. For a lot of growing businesses already relying on FreshBooks for their accounting needs, this is a handy little feature. Though it might not incorporate the wider range of features included in other expense management tools, for a lot of growing businesses, FreshBooks is a good place to start. If you’re already using FreshBooks to help manage your accounts, be sure to check out its automated expense management tool - you might not realise how useful it is. Pros: Widespread; easy to use; intuitive user interface. Cons: Foremost an accounting solution; limited functionality beyond expense tracking. Finally, let’s take a look at some of the tools out there for larger enterprises. For larger companies, spend management is a high-stakes question. After all, the more employees making purchases, the more time is spent processing reimbursements. A larger number of employees can also contribute to a higher likelihood of expense fraud, as it is often more of a challenge to keep tabs on where company funds are going. But fear not! We’ve got a couple of useful tools to help you stay on top of things. Aimed at simplifying the travel expense reimbursement process, Certify helps larger companies to streamline their systems and save time. For larger enterprises with a workforce on the move, this is particularly helpful. Certify includes a handy mileage calculator, and its web-based platform makes it easy for users to take care of common travel expenses like tickets and meals. Companies can also customise approval flows, making sure expense claims go to the right place. 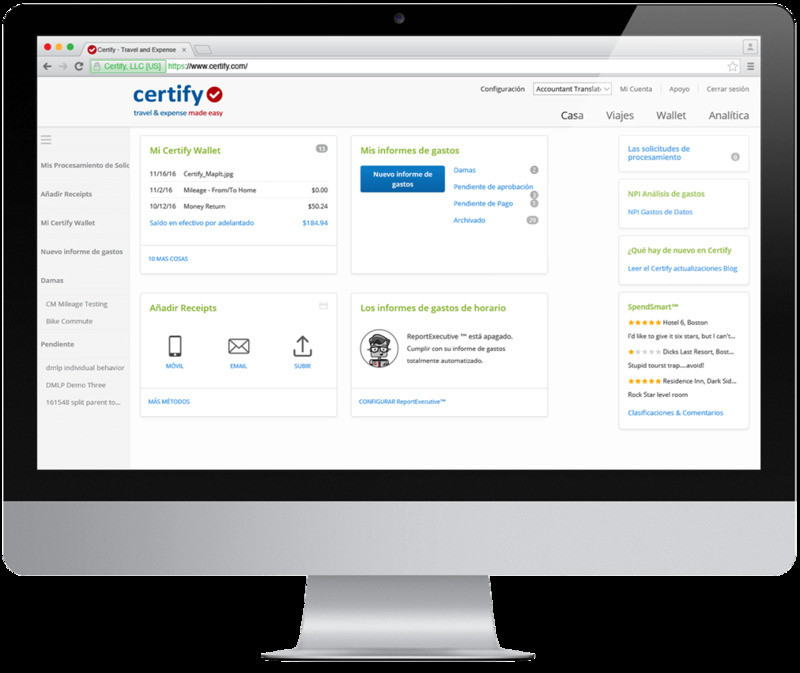 Certify also includes an intuitive and easy-to-use interface, allowing users to manage their expenses quickly and painlessly no matter where they are. Pros: Built specifically to handle travel expenses; great mileage calculator. Cons: Not as suitable for growing startups; limited wider flexibility. FinancialForce is a multi-purpose cloud accounting tool aimed at helping larger businesses organise their operations. Built with a high degree of flexibility, FinancialForce is well-suited for businesses looking for a simple, clear picture of their financial performance. While more of an general accounting tool than a bespoke spend management tool, it does feature a powerful cash management function. With FinancialForce, users can handle transactions and reconciliations from multiple accounts and currencies. 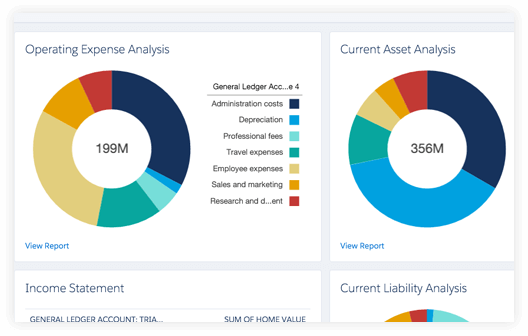 FinancialForce includes a strong focus on financial reporting and modelling, helping users to automate a lot of time-consuming tasks. Businesses using FinancialForce can also automate payments to vendors, as well as quickly matching purchase orders and invoices. Pros: Quick and easy modelling; simple spend management automation. Cons: High flexibility and customization takes time to master. Agencies have a unique challenge when it comes to managing spend. They have different budgets for each client, and need to carefully keep track of time, spending, and resources for each. In researching this post, we found an interesting expense and project management tool that appeals especially to agencies. Avaza combines the key features of project management tools like Trello or Slite, alongside some good expense management features. Users can track time spent on a project either manually or in real time, which is a big need for agencies and consultants. The tool lets you create budget estimates for projects, then track spending as the project goes along. Expenses are assigned to the correct project and can be labeled non-billable where appropriate. Pros: Free trial lets you test most features; customisable depending on the project; combines lots of tools in one. Cons: No accounting features; may be too large for managing small projects. When it comes to spend management software, it helps to know what you’re after. If you’re a freelancer or small business owner, you’ll want something that’s simple and easy to use. If you’re a growing business or a large enterprise, chances are you’ll want something a little more comprehensive, with enough flexibility to suit your needs. Whatever you decide on, don’t hesitate to switch to using a spend management tool. Not only will you save a lot of time and effort, you’ll also have a higher degree of certainty over where your funds are going.